Today’s kind of post is kind of a rambly one. The type that you begin writing at 12am, that could potentially be complete and utter jibberish, but could also be the best piece you have ever written. NIGHT OWL. Each night, when I finally get myself into bed, often after a really long day, utterly exhausted and I just can’t sleep. Lots of thoughts roll around my mind, some nice ones and some not so nice ones. Often quite a lot of self hate, mixed with high expectations of myself. You know that amazing time in life, when you just see something, and it inspires you to do something. I really value the inspiration around me when it comes to writing up interesting posts. (Well, I like to think they are) This is just what happened when This Material Culture contacted me. 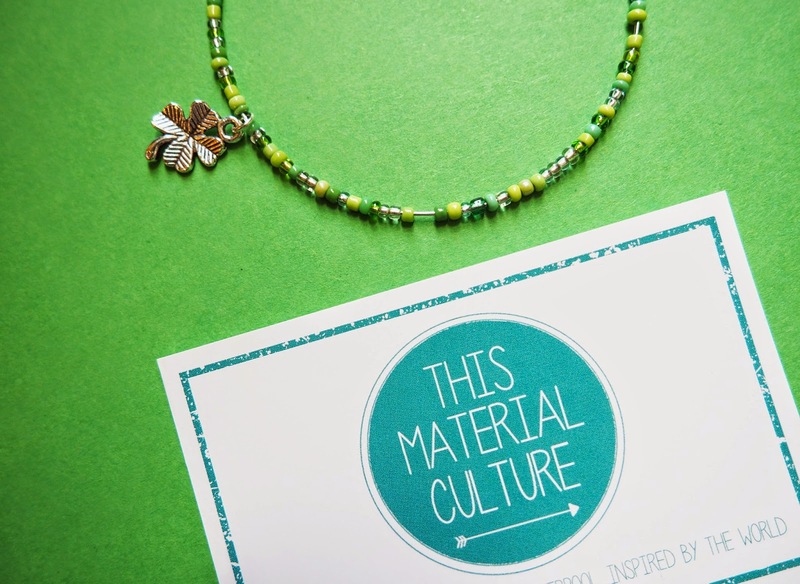 This Material Culture are a small Husband and Wife business, based in Liverpool, specialising in hand-made jewellery – with a cute quirky style. I think being Husband and Wife is super SUPER cute. They inject personality into the pieces they make, including pieces for the Game of Thrones and Hunger Games Lovers. Everything is also at an affordable price so you aren’t going to break the bank, being the perfect gift for family or friends! I particularly like the bangles or the necklaces, but they also have earrings AND a men’s range! You should take a peek at their shop here – I think you lovelies will really adore their products. I was kindly gifted the Lucky Bangle* (£10) With green being my favourite colour, it caught my eye instantly. 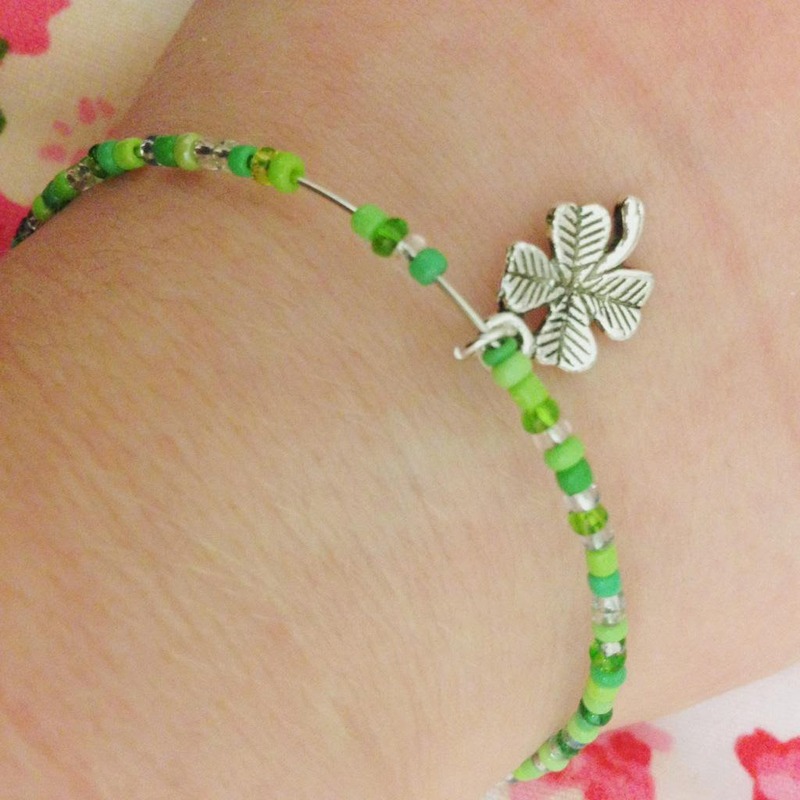 Also… who doesn’t love a ‘good luck’ charm! Saying that…. this isn’t actually how I view my new bracelet. Jewellery is incredible. It can have one meaning to one person, and a completely different meaning for another. For one, this bangle might mean a lucky charm but for another, simply a reminder of what to feel thankful / lucky for. This is how I view it anyway, which is where this post inspired me. “I feel like there is still the really happy bubbly Kayleigh inside my head and she is brave enough to come out to all you lovelies in the blogging world, family and at work with colleagues etc, but sometimes in situations happy bubbly Kayleigh is so so small, and Irritable Sad Kayleigh likes to knock her down and be all loud and angry and take over her so that Happy Kayleigh can’t shine through.” I realise this sounds a little mad, but still, it is the way I feel I can attempt to explain what is going on. This all started to begin really after my nan passed away. My nan was the most incredible woman in the world – I truly idolised and adored her, and I miss her so so unbelievably much. (I am crying whilst writing this 🙁 booo) I would do anything to hug her (never letting go) and go for a hot chocolate and a cake. Anyway, I like to try and remain positive on Very Berry Cosmo so I am going to try spin this around! This lovely bracelet from This Material Culture (that I am currently wearing daily, because I LOVE IT) to me is just a little reminder of how extremely lucky I am for the life I live. I should be thankful for all the wonderful times that I had with my lovely nanny, and all of the other amazing people that surround me in my life, who are all just so great. Dad, you are fabulous <3 I have also had a fabulous year working as a Graphic Design Intern and I am doing well in my degree. I can afford to eat pretty nice food as well as buy myself a few beauty treats, plus a roof over my head, and unfortunately this isn’t the case for everyone. There is something about the human mind that really does baffle me, are we ever happy with what we have, or do we always want more? Sometimes you just need that little reminder that you really have it good in life – and for me, this little bracelet does just that. I do hope that with time happy Kayleigh will outshine sad Kayleigh, but for now I am going to try and jam it in my brain that I am very thankful and lucky. Thank you This Material Culture for providing me the inspiration to write this post, as well as a gorgeous bangle! I have my eye on the arrow necklace because it is wonderful! Hope you enjoyed this post lovelies – and remember to cherish your loved ones and be thankful for the life you live. Previous Post YOUTUBE | Manchester Blogger Fun! This was absolutely beautiful to read. TMC are a wonderful company, and Im so glad you've found something that you connect with and makes you feel good! I looooooove this post, really felt like it came from the heart and was so touching to read! I've never heard of TMC but I love the sound of what the're about, and what you've taken from their jewelery. So lovely. I always used to do this when I was younger – different bracelets to remind me of different things – but I haven't for years. Gonna get back into it now and look at TMC's website, thanks for kicking me up the backside in remembering to love myself!!! Kay <3 this was so beautiful to read and I wish I could come give you a big hug!! You're amazing and funny and kind and I love you to bits, I'm so sorry irritable Kayleigh is coming out and making happy Kayleigh feel small, but remember happy Kayleigh is always there she just needs to get strong enough to tell irritable Kayleigh where to go!! Love this post so much, Kayleigh, and the fact that such a small item (in the grand scale of life-y type things) can mean so much for you. Massive hugs to you, we're all works in progress, and I do love that you're this little beacon of positive energy despite not always feeling so fab. You're wonderful, you are.